Have students try these activities to extend their knowledge and interest in electrical energy. Set up a science center where students can construct parallel and series circuits. The center should provide insulated wire, batteries, bulbs, switches, and directions. Suggest that students investigate the differences in parallel circuits and series circuits by loosening bulbs in the circuits. 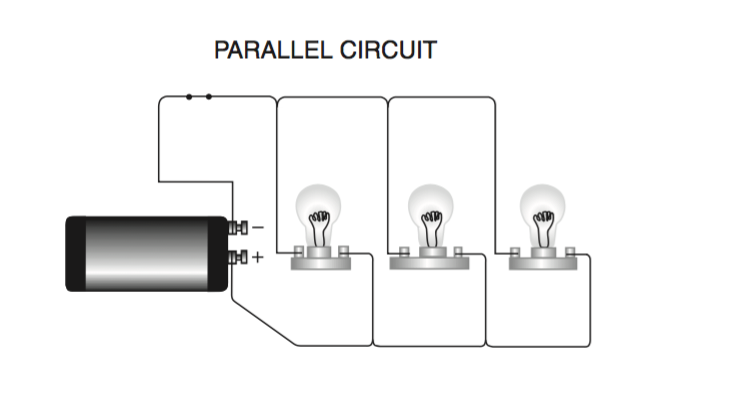 Ask questions to help students conclude that bulbs in parallel circuits remain lit because the circuit provides more than one path for currents to travel. Have interested students draw a map of the United States and locate on the map hydropower plants. Tell them to label cities that are near the hydropower plants as well. Remind students to use a map key to identify any symbols they use on their map. Have students investigate the amount of power each plant generates and the number of customers it serves. They can record this information directly on the map at the site of the plant and in graphs that they create to accompany the map. Remind students that many words have more than one meaning. Writers often play with these words to have fun with the language. They might write headlines of sentences that use both meanings of a word. Point out examples of the play on electricity-related words in the headings and sentences of Electricity. An examples includes “This set the stage for a burst of discoveries that electrified the world” in the History of Electricity and Magnetism. Discuss the different meanings of the words in the phrases and sentences. Then encourage students to write their own word plays using words related to electricity. You might suggest that they focus on words such as charge, electrifying, positive, negative, current, circuit, dynamic, and static. Arrange for a field trip to a local hospital or medical office where students can see EKGs and EEGs. Ask for a lab technician to explain how the equipment works and to identify characteristics on a readout. Units of measure related to electricity have been named in honor of scientists. These units include volts, watts, farads, faradays, coulombs, ohms, and amperes. Students read about some examples in the History of Electricity and Magnetism. Have students develop a chart that identifies the units of measure, tells what they measure, list the individuals for whom they were named, and cites reasons why the individuals’ names may have been used. identify proper usage of electrical appliances, energy-saving tips, and safety rules to avoid a “shocking” experience. Encourage students to use graphics, word plays, and headings to make their booklet inviting. They may want to make multiple copies of the booklet to share with younger students and to have available in the school library.